Why should I get custom orthotics over an off the shelf device? Don’t they just work the same but cheaper? We often hear the terms insoles, inserts, arch supports and orthotics thrown around, though individuals don’t understand the true meaning of these terms in a professional setting. Quite often these terms are used in conjunction with each other making it difficult to determine which pair are going to be correct for your foot posture and yours needs. The terms insoles, arch supports and inserts are essentially the same thing. These particular types of insoles are often found at your local chemist and are sold as an off the shelf device, which aim to provide extra cushioning and minor support to your current shoes. Due to the soft nature of these insoles they will often have a short life span of about 3-6 months, as they flatten out and reduce the amount of support that you previously had. Nowadays the term orthotic is used more frequently. Orthotics are usually only found within medical clinics such as your local podiatry clinic. Orthotics are a firm supportive device that provides arch support and will assist in the correction of your walking pattern and biomechanics. With orthotics you may here the term “custom orthotics” which are customised to your foot type so that no other individual will be able to wear this device. In order to have custom orthotics prescribed to you, you will be required to undergo a biomechanical assessment in which your foot posture, leg, knee and hips are assessed. 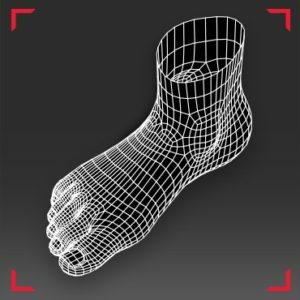 Typically, custom orthotics are produced by taking an imprint, mould or foot scan of your feet, which is sent off to a lab to create your custom device. 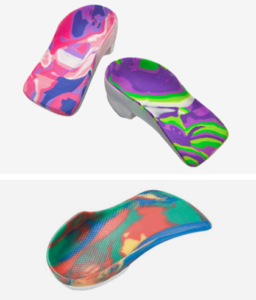 Custom orthotics have a longer life-span than off the shelf insoles due to the firm, plastic material the device is produced from to withstand high intensity activities such as running and lower impact activities such as everyday wear. If you have been suffering from ongoing foot, ankle, knee and leg pain, have flat feet or high arches then come and see one of our friendly podiatrists today for an assessment to determine if custom orthotics would be a benefit for you. It’s important to make sure that you are getting the right type of orthotic for your needs to ensure you get back on your feet as soon as possible. This article was written by Lauren, one of our skilled Podiatrists. To book in with Lauren either give us a call or book online and select ‘Lauren’ as your practitioner.